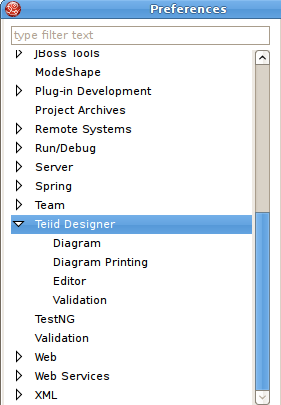 The Teiid Designer provides options or preferences which enable customization of various modeling and UI behaviors. Preferences can be accessed via the Edit > Preferences action on the Main toolbar. General Teiid Designer preferences include. Always open editor without prompting To change/edit a model, it must be opened for editing. Checking this box will automatically open the model in an editor if the user attempts to perform a change in a model. If unchecked, the user will be informed that an editor will be opened before the operation is completed. Open Designer perspective when model is opened - If a model is opened via importing projects, the New > Teiid Metadata Model menu and the Teiid Designer perspective is not open, you may want to automatically open the perspective and beging working on your model. This preference has 3 settings. Always open, which means always open the perspective without prompting; never open, which means do not open the Teiid Designer perspective, or prompt, which will always ask you if you wish to open the Teiid Designer perspective. Check and update imports during save occasionally editing a model may add or remove objects in one model that reference objects in another model. Model Imports keep track of these dependencies within each model. A validation error or warning may appear during a build. Checking this box will automatically check and update imports during the save process. This will result in any unneeded imports being removed from the model or any required imports added to the model. If unchecked, no updating of imports will be performed. Import Logical ER Models as View Relational Models - When importing ER models, the default relational model created during the import process is a Source model. This preferences, forces the importer to create a View relational model instead. Enable Preview - If the Designer Runtime feature is installed and a Teiid Instance is defined, Teiid Designer will automatically keep the preview artifacts (VDBs) in sync with the workspace models. Unchecking this preference will disable preview feature and not create preview artifacts. Enable Preview Teiid Cleanup - If operating Designer with Enable Preview = TRUE, then this preference will result in automatic clean-up of your preview artifacts from your Teiid servers. Any preview VDBs or preview data sources will be undeployed from your servers as part of Eclipse's shut-down process. Several diagram preferences are available to customize your diagrams. Notations - Standard diagram notation for Teiid Designer is based on UML notation. Future releases may include alternate notations. Routers - The relationship link type for Package and Custom diagrams (Foreign Key - Primary Key relationships) can be customized. Available options include Orthogonal (default), Direct or Manual (user defined breakpoints). Font Settings - Select font type, style and size. Background Color Settings - Select a unique background color for each diagram type to help differentiate between types. Model Size - Displaying very large diagram may take a considerably long time. This preference allows users to set an upper limit on the number of objects to display in a diagram. If this limit is exceeded, a warning is displayed to the user and the diagram is not constructed. Relationship Options - UML-type relationships can be customized in a couple of ways. Role Names and Multiplicity labels can be shown or hidden using the check-boxes labeled Show Role Names and Show Multiplicity. 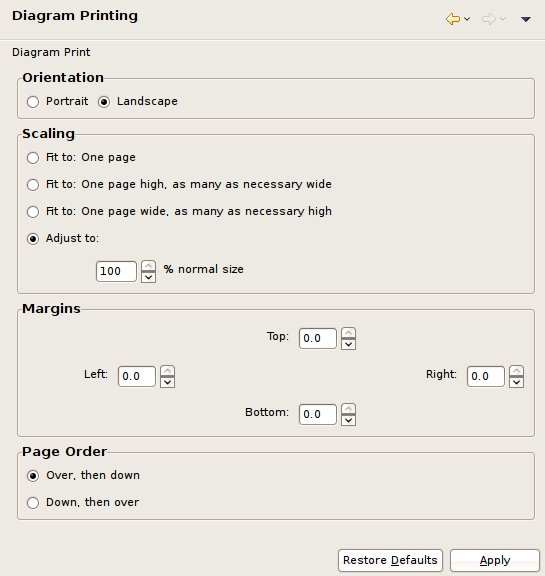 Diagram print options are stored as preferences. These can be accessed through this preference page, by right-click on diagram Page Setup action , or via the Modify Diagram Printing Preferences action located on the vertical diagram toolbar . 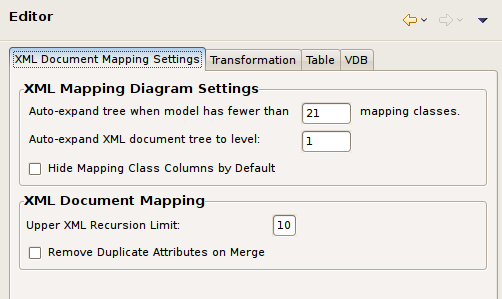 XML Document Mapping Preferences provide ways to customize Section 10.3.1.1.4, “Mapping Diagram” and Section 4.2.4, “Recursion Editor (XML)” behavior. Section 10.3.1.2, “Table Editor” Preferences provide a way to customize the order and the information content for each model object type. 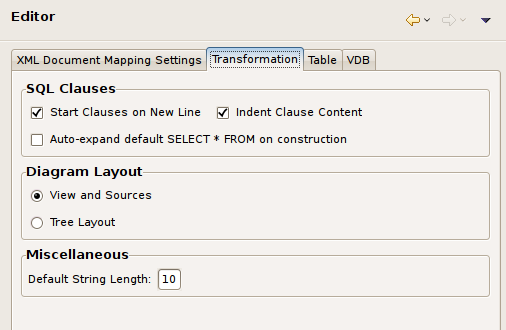 Section 4.2.1, “Transformation Editor” Preferences provide a way to customize SQL formatting, diagram layout, and default view entity properties. 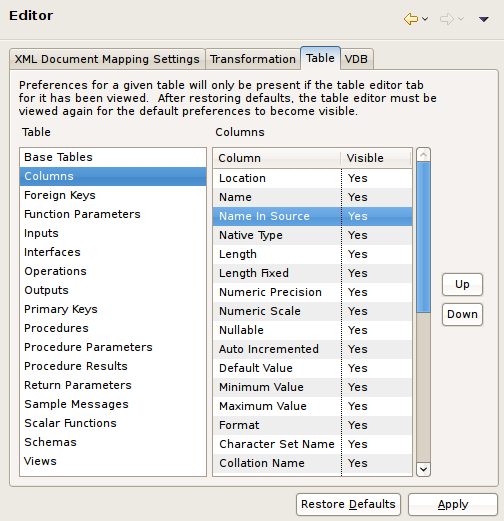 Section 10.3.2, “VDB Editor” Preferences provide a way to customize VDB editor behavior. Validation Preferences provide a way to customize the severity of some of the rules checked during model validation. 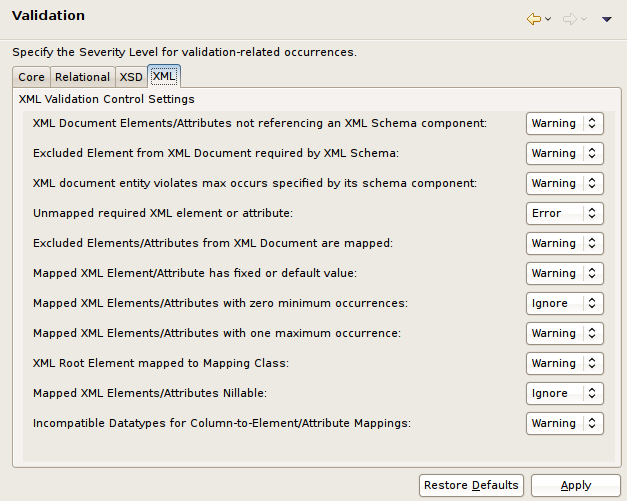 Validation preference pages, shown below, include Core, Relational Model, XML-related and XML Schema (XSD) models. Increasing the severity level to error will prevent you from testing your VDB or deploying a web service if violations of that preference are found during validation.